'XNOR' gate using pass transistor logic. 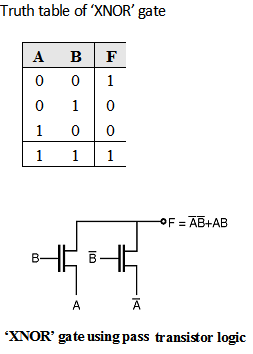 The truth table of 'XNOR' gate is as shown in Table below. In this gate if the B input is low then right NMOS transistor is ON and the inverted logic value of A is copied to the output F. When B input is high left NMOS transistor is ON and the logic value of A is copied to the output F, which satisfies the truth table of the XNOR gate. 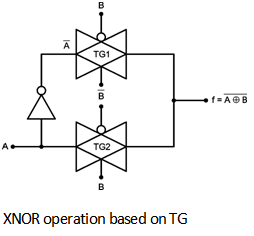 A  B	=	A  –B + –A  B Figure below shows the implementation of XNOR gate using transmission gate.